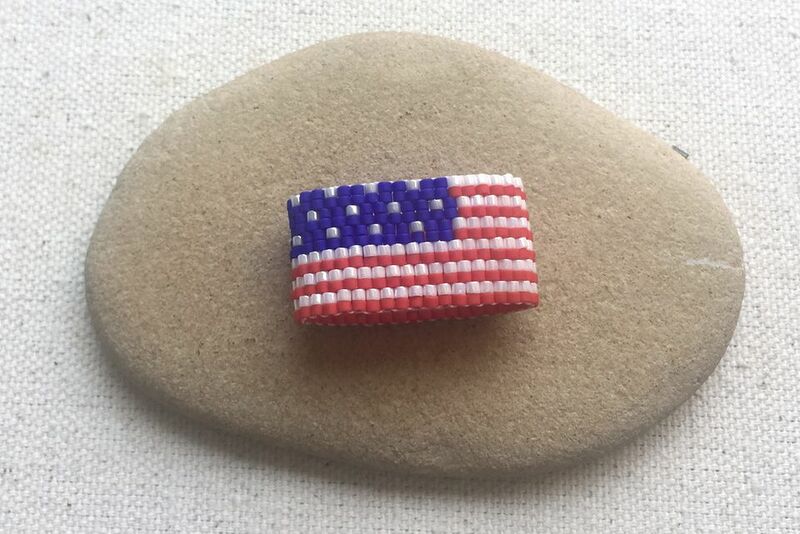 I designed this peyote ring with 4th of July in mind, but there are so many days and reasons to wear an American Flag. I consider it a great way to honor our service people and remind myself of the freedoms we are so lucky to have. I designed the pattern using BeadTool software. The word chart and detailed pattern is at the end of the step by step tutorial. For my peyote ring, I used four different colors of Delica beads. opaque matte brick red, opaque luster pearl, opaque matte cobalt blue and opaque luster grey. I almost used galvanized silver beads for the stars instead of the grey, and I wish I had. I think the color would stand out a little more against the blue. The shade of grey I used is a little too close to the white. For my peyote rings, I tend to use a thicker Fireline beading thread than usual. In this case, I am using 10 lb. Crystal with a size 11 Tulip beading needle. I find the stiffer Fireline helps the ring hold its shape better and I don't worry as much about the thread breaking. To follow the pattern, go to the last slide. Note that I started my design with the stars and stripes section. I did that because I wasn't sure if I wanted stars and stripes in the entire design or just part of it. By starting with this area of the design, it helped me gauge when to change to just stripes. Add a stop bead to your thread. Pick up the beads for the first two rows of beads. Note that I am using two drop even count peyote stitch. Two drop is very similar to regular peyote, but it is much quicker. I also liked the way the pattern aligned best in two drop peyote. To start two drop peyote, pick up two beads, skip two beads from the prior row and stitch through the next two beads. In two drop peyote, you will always be picking up two beads at a time and stitching through two beads at a time. Pull your thread tight. You will need to move the beads with your fingers to align them so that there are a row of two beads stacked on top of two beads. Be patient and use your needle to help ease the beads into place. Continue the row of 2 drop peyote by picking up two more beads, skipping two beads from the prior row and stitching into the next two beads. At the end of the row, pull the thread tight and make sure all of the beads are stacked on top of the beads from the prior row in pairs. Continue adding two drop peyote rows. The pattern for the stripes is very easy to follow, but the stars are just a little more difficult. Once you have added the first row of beads for the stars, you will see the pattern that each star is completely surrounded by blue beads before another star bead is added. To size my ring, I always use a paper template. I wrap a strip of paper around the finger that I want to wear the ring on and make a mark where the paper overlaps. That is approximately how long I want my beadwork to be. In this case, I also decided I wanted to the stars to go halfway around my ring. That way no matter how my ring turns, you would probably always see part of the star design of the flag. To measure this section, I just made a fold in my ring template and beaded up to the fold with the stars and stripes section. Now the ring is really fast to make! The stripes portion is an easy pattern of picking up one red and white bead for each stitch. But don't get too comfortable. The easier the pattern, the easier it is to make a mistake and pick up the wrong beads!! Stitch until your beadwork matches your template and wraps around your finger. Note that the ends must be able to zip together, which means there is high (or out) bead on one side and a corresponding low (or in) bead section on the other side of the row. Fold the sides of the ring together and begin stitching through the high beads on either side of the ring. This will begin to pull the sides of the ring together. Be sure to continue stitching through two beads at a time. When you have zipped through the entire row, your two thread ends will be side by side. Although I don't always add knots to my beadwork, I think this is the perfect place to tie off the threads with a square knot. Pull the knot securely. After adding the square knot, continue stitching up and down the row two beads at a time. You want to be sure you go through the rows next to where you joined the side of the ring. This will help reinforce the ring. I generally stitch through the center rows for 4 or 5 rows before I reverse direction and tie off my thread. When it is time to end my thread, I weave the thread to the inside of the ring. Then I use my thread burner to cut the thread as close as possible to the beadwork. This will prevent the small end of the thread from poking between two beads on the outside of your ring. Remove your needle from the working thread and add it to the tail thread. Weave in the tail thread the same way you did for the working thread, but in the opposite direction. Here is my finished ring. You can wear it so the stars and stripes pattern faces toward you or away from you. Another possibility for this ring pattern is if you were to continue stars and stripes around the entire ring. Then your finished ring would look like this. Note that I did not make a second ring for this picture. Because my stars and stripes go half way around the ring, I can make it appear that it goes around the entire ring by how much of it I show in the front. Similarly, I can make it look like the ring is just red and white stripes by turning that section to the front. This picture shows the pattern sections for the peyote ring. I only put in sections of the pattern up until the areas where the pattern repeats. For example, the Stars and Stripes section, row 3 begins repeating at row 11. That means you can work your pattern until row 10 and then go back to row 3 to continue the stars and stripes until you decide this pattern is long enough. Similarly, the pattern for the stripes repeats every two rows. You just keep making the stripes until your ring is long enough.